The Fernhurst Society is for everyone, in or out of the parish, who has an interest in Fernhurst; its past, present and future. As many members will know, during its short existence the Society has completed surveys on the local biodiversity, land use, hedgerows and some buildings. 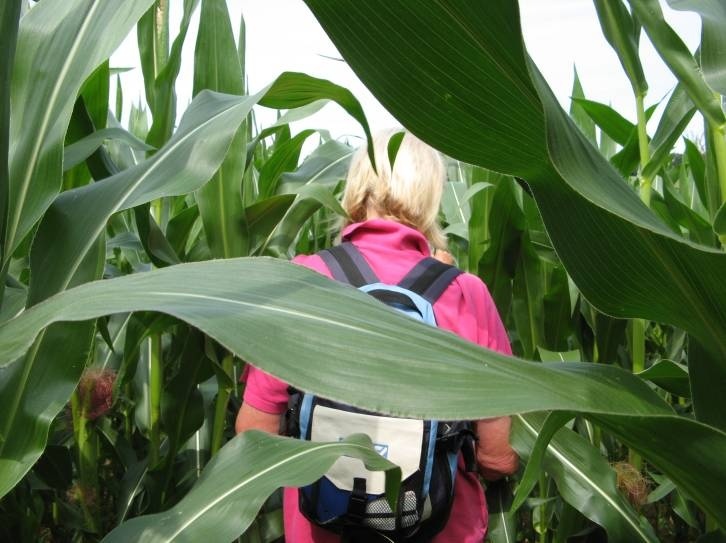 The Society organises several talks a year and almost as many walks; it has produced leaflets on short walks around the village and is planning to publish some longer walks. The Society disseminates information on local issues and the associated Fernhurst Archive looks after our heritage and puts on exhibitions and displays. We welcome everyone, members, friends and visitors to all our events and to the Fernhurst Archive (open Tuesdays from 2.30pm – 5pm) and hope you will all come and let us know what you would like to hear/know/visit or see. Talk by Peter Jerrome, author and expert on the history of the buildings and people of Petworth. Village Hall 7.30pm for 8pm Billet-wood and Bavins – a brief history of coppicing Illustrated talk by Jon Roberts, woodsman at the Weald and Downland Museum. 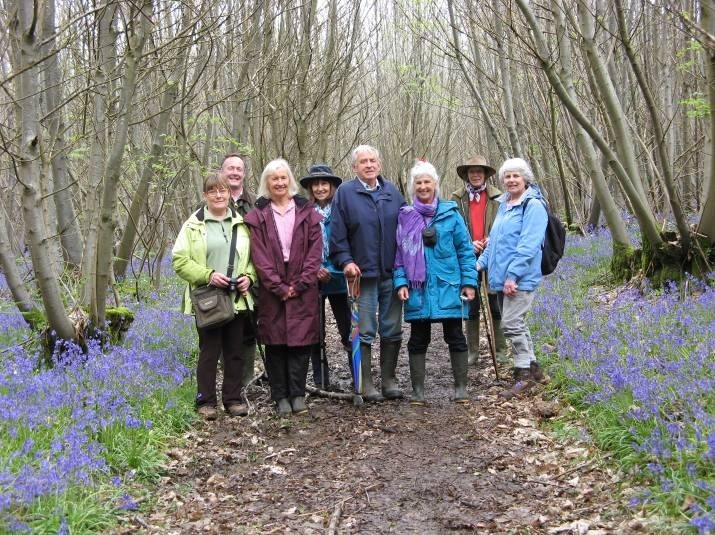 A local walk from the centre of Fernhurst led by Bob Smalley - meet at Crossfield car park at 1.30pm. Village Hall 7.30pm for 8pm AGM followed by talk on Chatham’s Historic Dockyard AGM followed by talk given by Admiral Sir Ian Garnett. Flora Thompson is best known for ‘Lark Rise to Candleford’, her book on growing up in rural Oxfordshire in the 19th century. John Owen Smith is something of an expert on Flora's life and work and has written several books on the subject. He has an easy delivery speaking fluently without notes as befits the stage actor he is. 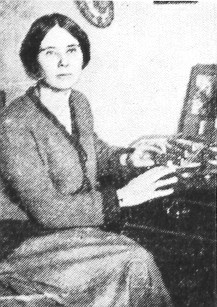 John traced Flora's life as a child in Oxfordshire through her working life as a postmistress in Liphook and Grayshott to her ‘retirement‘ in the West Country. It was her life at Woolmer Gate, Griggs Green, Liphook that interested one member of an enthralled and substantial audience as he unwittingly followed Flora to live in the same house for many years - it now bears a plaque to Flora's residence. Nine intrepid members set off for Flexham Park near Petworth led by Iain Brown who had been briefed and had reccied the area beforehand courtesy of Mike South (the same ICI colleague who last year showed us the wild daffodils in the same area). The bluebells, stitchwort, garlic mustard and spurges were magnificent. During the course of the reccie with Mike, Iain discovered he had been at Aberdeen University, the same year and in the same class reading forestry as Mike's uncle Alan and a reunion is planned. In 2009 Haslemere Granny Tess Burrows and her then partner, Pete Hammond, took part in the first race to the South Pole since Amundsen and Scott almost 100 years previously. It was no easy haul. Preparation included dragging tyres through the streets of Haslemere to build up the strength to pull a sleigh. Still looking supremely fit, Tess explained her main motivation was to raise awareness for peace throughout the world. Tess and Pete were given permission to raise peace flags at the base camp. Tess and Pete completed the 420 mile course battling medical issues and the severe environment (Olympians Ben Fogle and James Cracknell came second).Through her fundraising and peace-awareness activities (including climbing Kilamanjaro and peaks in the Himalayas, the Andes and Hawaii) Tess (and Pete) have raised over £100,000 for schools for underprivileged children in Nepal. 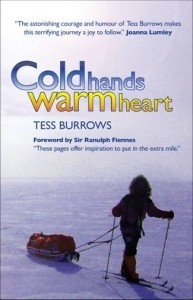 Tess’s account of the race to the North Pole ‘Cold hands, warm heart’ is available from local bookshops or online. Knots and Knitted Bathing Costumes told the story of the young girls who joined the Girl Guides in Fernhurst in the 1930s under the benevolent rule of Miss Margaret Shaw. The exhibition came about because a collection of handwritten magazines and delicate nature study watercolours, all by Miss Shaw, were presented at Nicholson’s Auction House last winter and acquired for the Archive by a local consortium. The 64 magazines, covering 1928 – 1933, were packed full of guiding news, badges to be worked, guide camps and hikes, etc but there was also room for local news, stories, poems, competitions, nature notes, handicrafts and fashion tips and some rather awful jokes! They were lavishly illustrated with her own photographs and watercolours. Fernhurst’s Vicar at the Front gave a glimpse of the Rev. G. H. Ranking’s experiences in the trenches in France in WW1, contrasted with life back home. This part of the exhibition was organised to mark the centenary of the outbreak of WW1. Rev. 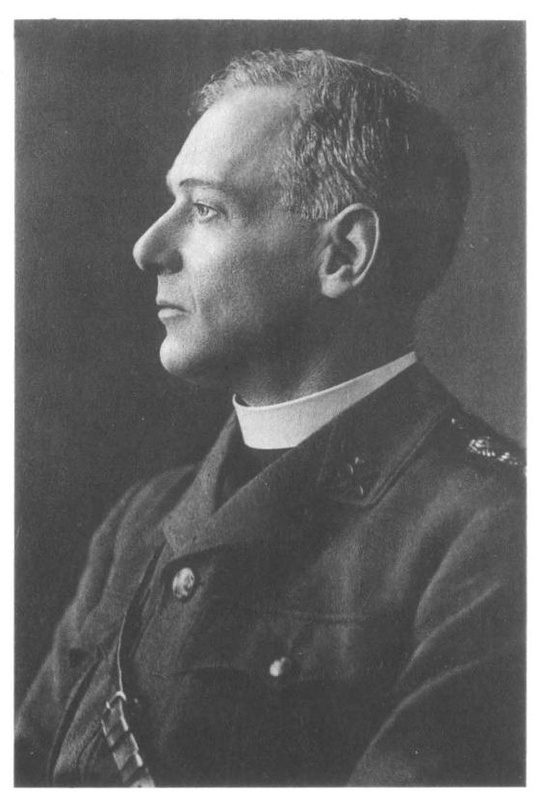 Ranking gave a very lively account of his experiences as a chaplain in letters that were published every month in the parish magazine. He made light of the horrors around him and tried to keep up the morale of those about him and especially by sending back news of local men to their anxious families. Back in Fernhurst the community had to contend with a detachment of Gordon Highlanders who were billeted here and commandeered the school for several months, as well as doing what they could for the war effort. The exhibition also included WW1 memorabilia, such as a piece of trench art, one of the silver-topped walking canes presented to every Fernhurst serviceman on their return and a hand grenade turned into a money-box. There was also Mrs. Salvin’s address book, in which she listed all the names and addresses of Fernhurst soldiers and sent them parcels of food and other comforts. Almost 200 people attended the exhibition, some bringing their own items to share. There was a second chance to see a smaller version of the exhibition at the Revels a week or so later. Have you got a tablet? 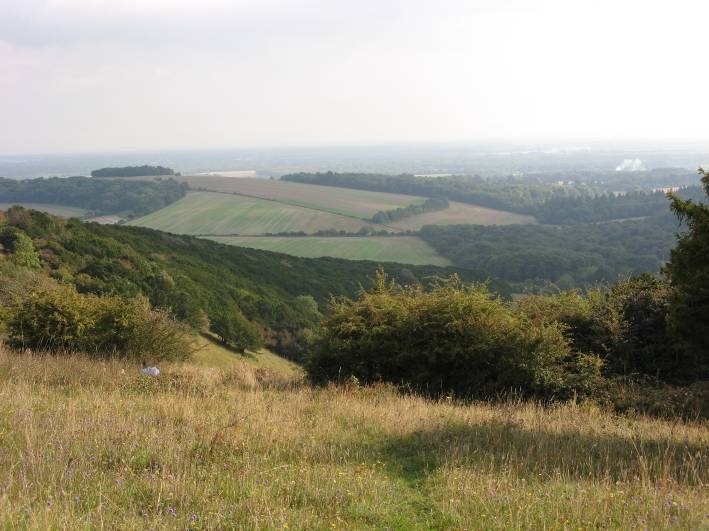 Bob Smalley’s account of the walk he organised to celebrate our wonderful countryside and the opening of the South Downs National Park Centre in Midhurst. The weather was kind, not too hot, not too cold, some sun, but not too much, no rain. Still the gardeners found something to moan about. We set off from Crossfield car park with about 12 at a cracking pace; which I thought would never last. I was wrong and we zoomed through the village at a speed of at least 400 words per minute. Quiet stroll in the countryside; some hope! The scout hut passed by unnoticed and as we passed through Homelands Copse I thought we might have got a glass of water, but alas no. Something I said? Hurstfold and then the Hill; pace slowed, but still 400 wpm. Reached the first meeting point on time and met up with band 2 including the two youngsters who were to be my companions for the rest of the walk. Wonderful. I told Iain not to wear his old jungle warfare kit but he took no notice. Onwards and still upwards…to the mast and beyond. Buzz Lightyear! Ask the kids. About 22 strong now; we were rewarded with the most splendid views of the South Downs, which just makes you feel good to be alive. Down now, deeper ’n’ down (oh come on, Status Quo… they’re even Granddads now) towards our next meeting point - the Queen Elizabeth Oak. Waved frantically at Judith in the distance. No reaction! Dogs saw us and waved, Judith was elsewhere. Now about 28 strong; we crossed Cowdray Golf Course. I’d asked if Barnes (Wallace) could be restrained for the day so we weren’t peppered with golf balls. And down towards the Race. Obviously Brown had inside information and the jungle warfare kit! Some of the party got lost. I don’t think we will see them again. Then on to the Midhurst HQ for tea and photos. Some of the party got lost – I don’t think we will see them again. As we were walking down, down, deeper ’n’ down, one of the children encountered some stinging nettles. “BOB, I’VE BEEN STUNG AND IT HURTS”. Yo! Boy Scout or wot! Out I takes my magic potion (Boots bite stick £2.50, smells of ammonia). Thinks, nettles sting - can’t be bad enough for a pill. “No, sorry, no tablet”. “I HAVE, I’VE GOT MY OWN ONE, I CAN DO ALL SORTS OF STUFF ON IT”. 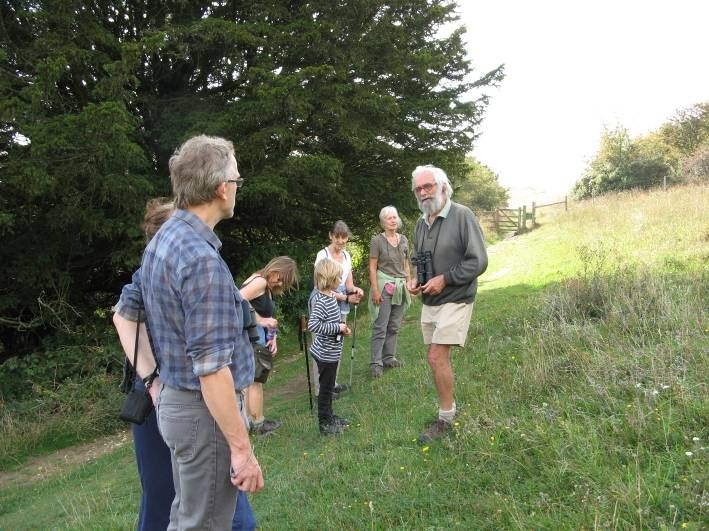 Nine of us joined this walk around the Reserve led by Richard Williamson (Kingley Vale warden for over 30 years). 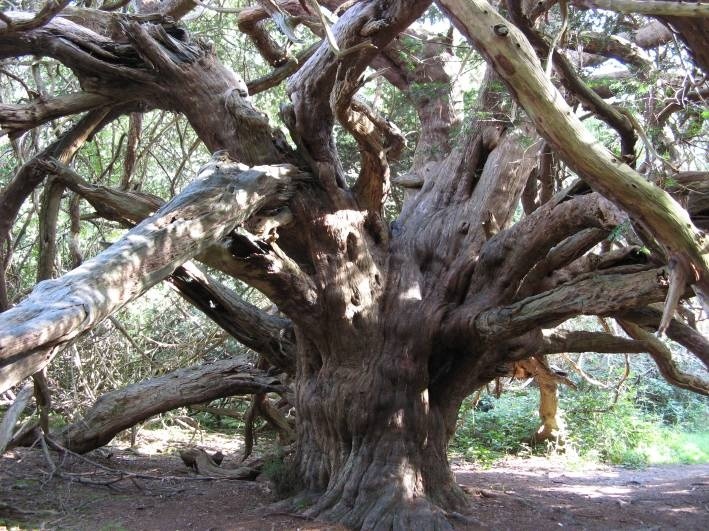 With around 30,000 yew trees, Kingley Vale has been described as having the finest yew forest in Europe and it is ‘on our doorstep’. Just inside the entrance, the information centre is illustrated with paintings on the ceilings and walls of birds and animals that can be seen on the reserve. Beyond that an ancient yew grove sits to the right of the main path. Here were the oldest trees – a spectacular sight with limbs touching the ground and layering to produce new plants. Camera crews come from all over the world to film these yews. Some experts believe they are over 1000 years old but Mr. Williamson believes they are a mere several hundred years old. Peppered with bullet holes, a number of the trees survived being used for target practice by Canadian troops in WW2. The tour continued in a relaxed fashion with Young Sam testing our guide with pertinent questions as we learned about the flora, fauna and history of the reserve. At the foot of the rising slope some of our group chose to rest by the pond whilst a number of us clambered after the spritely Mr. Williamson as he ascended to the top of the down where there are two important Neolithic bell barrow burial mounds. It was a privilege to be guided by a man who has devoted much of his life to the care of the reserve and thanks to Brenda who produced the wonderful photos of our visit. 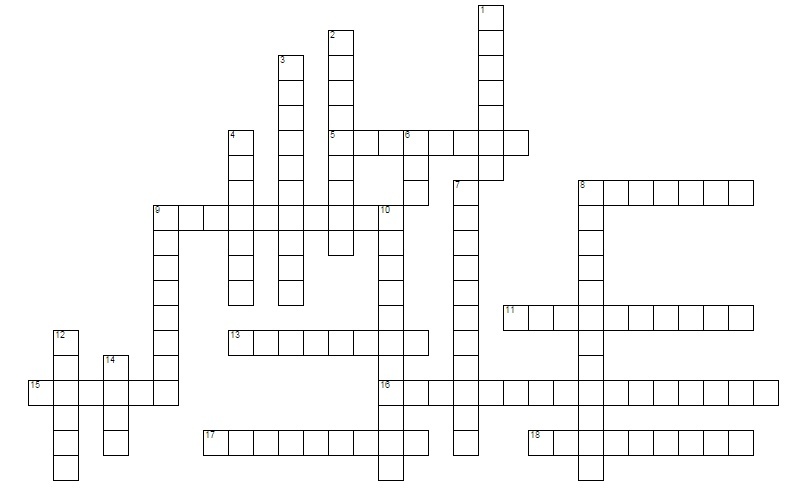 The crossword below is based on our visit to Kingley Vale and the information Richard Williamson shared with us. 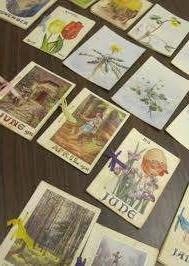 The answers are on the next page. 17	Counted by Richard Williamson each year, there are now over 2000 of this wild flower on the grassy slopes of Kingley Vale (3,6). In 1963 there were less than 100 - bringing sheep back to graze the slopes made the difference. The English Channel is essentially English whatever other countries hope and - with a mind of her own - she is always female! She has protected Britain from invasions over centuries only allowing those who have brought good into the country. Such was the theme of local resident Iain Kennedy's talk. Iain, from the north of England, saw the Channel for the first time at the age of 12 when the family went on holiday to Brittany. Dosed up with sea sickness pills, he found the water as calm as a mill pond. On the return a storm blew and, while all others were green and prostrate, young Iain played on the deck with pleasure and disbelief that others were feeling ill! The channel has not always been there and Iain gave a brief history of how it was formed and how it has formed our character to be insular, non-European and maritime – enabling us to build empires across the world. 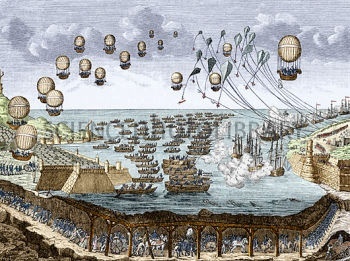 It has protected us from many European wars and nation-changing events - the French Revolution could have wiped out our aristocracy/monarchy if it had spread across the channel. Iain told of the repeated attempts at invasion. Romans – good – gave us central heating and straight roads. Normans - also good. Spanish Armada would have been very bad - could have brought religious chaos and greater intolerance. The Armada’s failure was helped by the Channel's unpredictable storms and the vast venture was sunk - almost literally. Louis X1V, just after England peacefully allowed in William III and Mary, also failed - mainly due to his maritime incompetence compared to Britain's might; which was at its very best by the time Napoleon thought he might make it over or under the channel. Not a success either way! The Battle of Jutland scuppered German plans in the WW1 and Iain put forth the theory that Hitler, although wanting to defeat Britain, was not actually prepared mentally to cross the channel as he thought it would bring the Americans into the battle whereas his expansion eastward would not. Not a great plan! Iain's run through of the English Channel's history was brief but amusing, surprising in places and educational - a good combination.